Dr Tohru Naruse was on a short visit (5-10 February 2015) on his way home from a research visit to Sabah. Tohru, who hails from the University of the Ryukyus, has a long history with the museum, being a postdoc here for many years, and has worked closely with many of the crustacean workers in the museum. 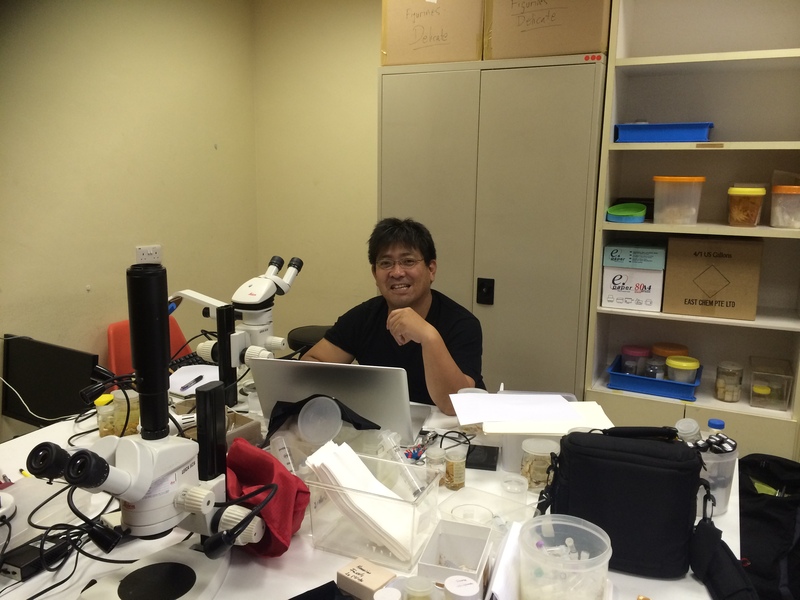 He is here sorting out his remaining boxes of specimens in the research room of the director, Professor Peter Ng. Like everything else in the museum, the books and material in this room are now being packed in preparation for the move of the labs and offices in a few weeks time. This small lab has hosted hundreds of researchers and students over the last decade, but will be replaced by new facilities now being set up in the Lee Kong Chian Natural History Museum. Tohru is therefore the last one to use this room for research, as he rushes to finish up the remaining papers of their collaboration! It is the end of an era.